Safeerase and Windows 10 disabled Windows Defender directory protection, problems occur when using the portable version of the File Eraser Blank-And-Secure! Some Safe-Erase Windows users do not know that portable programs in the working directory store the settings, and this is not always possible with enabled Windows 10 Defender Folder Protection, since some will start the program from the desktop or in other protected directories. 1.) ... The portable Version of BlankAndSecure! 2.) ... The standard version of BlankAndSecure! 1.) The portable Version of Blank-And-Secure! The portable version of the File Eraser stores the setting in working directory, please do not use a folder with folder protection in Windows 10, otherwise the settings can not be saved. 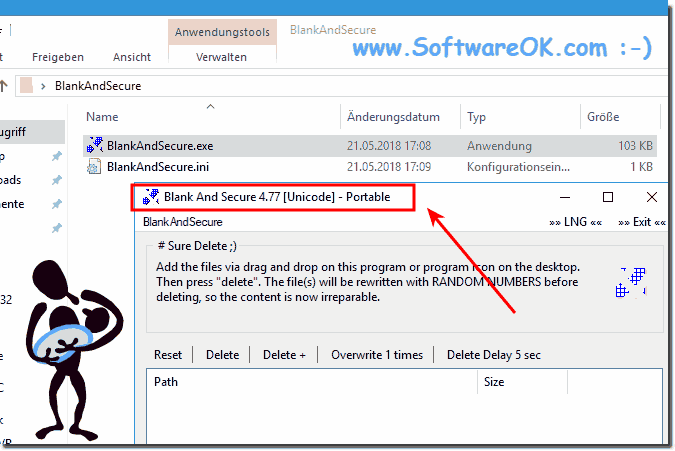 For better recognition, from 4.77 the program title also indicates that it is the portable version of BlankAndSecure_p.exe. in the file name! Or just create the BlankAndSecure.ini in the working directory. Attention! (Image-1) Portable use of the File Eraser under Windows! 2.) The standard version of File Eraser on Windows! There are no personal data stored here, only the program-specific, or their personal program settings for the operations of BlankAndSecure ;-)! (Image-2) The File Eraser Standard on Windows! The safe deletion of data can be so easy with the File Eraser under Windows, even under Windows 10 no problem! 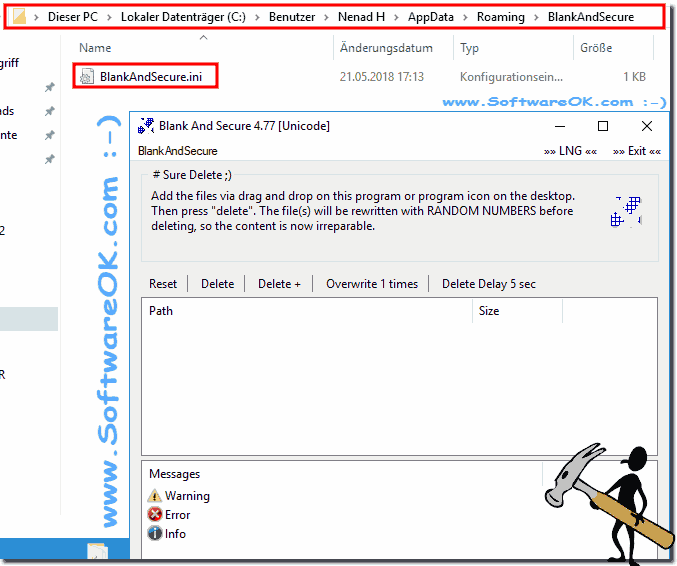 BlankAndSecure - FAQ-4: Portable use of the File Eraser under Windows (10, 8.1, 7, ...)!